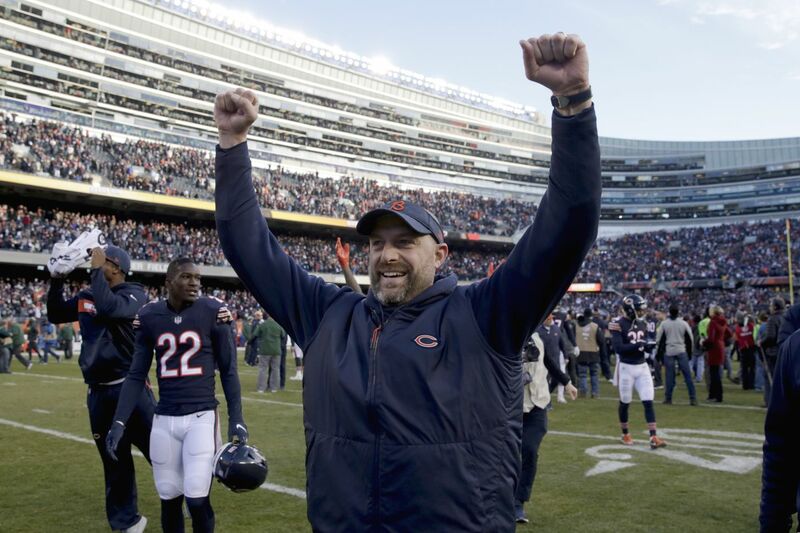 Matt Nagy succeeded Doug Pederson and Kansas City's offensive coordinator under Andy Reid. Eagles defensive coordinator Jim Schwartz has a lot to figure out before his players take the field Sunday in Chicago for their wild-card round playoff game. First-year Bears coach Matt Nagy is at the forefront of NFL offensive innovation, with a varied attack that can morph toward whatever Nagy feels an opposing defense is leaving vulnerable. Eagles' Carson Wentz unlikely to play in the postseason, so why isn’t he on IR? Informed of this, Nagy clarified. “It’s more like 750,” he said. Bears wide receiver Allen Robinson has called Nagy’s new age attack “a positionless offense.” The leading receiver is a running back, Tarik Cohen, who caught 71 passes for 725 yards and five touchdowns this season. Five Bears racked up more than 400 receiving yards, and three, including second-year quarterback Mitchell Trubisky, ran for more than 400. But the Bears’ offense ought to look a little familiar, as well, to Schwartz and to Eagles fans. Nagy began his coaching career with the Eagles, under Andy Reid, alongside Doug Pederson. Both followed Reid to Kansas City. When Pederson left the K.C. offensive coordinator’s job to coach the Eagles in 2016, Nagy succeeded him. Complex offense. Leading receiver is a small, darting running back. Mobile quarterback. Go back 10 or 12 years and in general terms, you could be talking about Reid’s Eagles offense with Brian Westbrook and Donovan McNabb. Eagles running back Tarik Cohen runs past the Eagles' Patrick Robinson (center) and Rodney McLeod during an Eagles win last season. Last year, the Eagles hosted the Bears and won 31-3, but Trubisky’s rookie-year coach was John Fox. Schwartz said that while many of the players are the same, the passing scheme is so different that the film from that game doesn’t help much. “They're unique. We have to treat them as unique. We can't treat them like our offense or K.C. or the Rams or anybody else,” Schwartz said. Officially, the Bears’ offense ranked 21st, because the NFL still ranks offenses by yardage, which at this point is beyond quaint. They rank ninth in points, which tends to matter more in the winning of games, at 26.3 per game. The Eagles ranked 18th in points this season, at 22.9, though in their final six games, five of them wins, they averaged 27.0. Trubisky is effective distributing the ball but his stats aren’t extraordinary – 3,223 passing yards, 66.6 percent completion rate, 24 touchdowns, 12 interceptions, a 95.4 passer rating. He has taken only 24 sacks, and has gained 421 yards on 68 carries – 6.2 yards per carry. “He's sort of a point guard out there moving the ball around to a lot of different guys,” Schwartz said. “He does a really good job of executing what they're doing in their run game, with all their layers of zone reads and RPOs. They run a lot of the different RPOs: three-by-one, two-by-two, slants, slant-flats, stick-outs, hitches, speed-outs. I mean, all of those. Schwartz’s group came a long way down the stretch after getting humiliated in New Orleans, 48-7, when the injury crisis was so acute, the defense was pretty much signing guys off the street to play in the secondary. Schwartz’s defense gave up 955 more yards and 53 more points in 2018 than it did last season, when the team went 13-3 en route to the Super Bowl, but it shut out the Redskins Sunday while limiting them to 89 net yards. Schwartz said the shutout didn’t matter much to him but was a “nice little reward” for his players, signifying their improvement. Yes, he said “BEARS out.” Probably on purpose.